The distinctive pilot cutters were used to take the pilots out to meet the large ships in order to bring them safely into port. 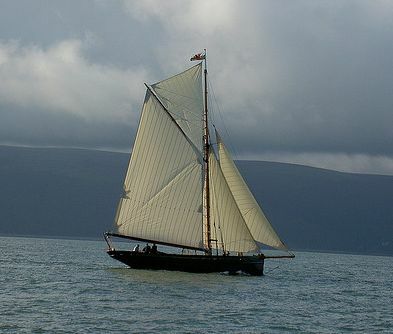 Swansea Museum owns and sails the Bristol Channel pilot cutter Olga, which can be seen in Swansea Marina when not sailing around Swansea Bay. The copper-ore barques were heavy, bulky vessels built for stamina not speed. Their crews were mainly Welsh, but tended to be rural not urban men. The wages paid to those in industry were so high that signing on was not an attractive proposition. However, for the men from the Gower where there was never enough land or work to go around, the prospect of the sea was appealing. It was said that Swansea’s Cape Horners were amongst the sailing elite, it was seen as a character reference for seamen. More than two hundred ships have been wrecked around the Gower Peninsula, but fortunately, Swansea has had a lifeboat since 1835 when it was kept in the River Tawe. Since 1866 the lifeboat has had close associations with the village of Mumbles, with its geographical proximity to the lethal Mixon sands. Smuggling has also been rife in the area, being the chosen method of sea-going communities wanting to resist the high taxes levied on basic goods, like tea.